Resolving nerve interferences where the sacrum joins the pelvis (hip) helps balance the pelvis and prepare for the optimal delivery of the baby. Nerve Interferences where the sacrum joins the pelvis (hip) can be quite common during the course of pregnancy. Besides potentially interfering with the baby assuming the normal head-down position in preparation for delivery, it can produce a variety of symptoms in mothers preparing for the culmination of their pregnancy. Developed by the late Larry Webster, D.C., the chiropractic technique he developed and taught chiropractors around the world, helps release stress on the pelvis, relaxing surrounding ligaments and reducing the sacral nerve interference to help restore more normal function. Sacral nerve interferences may cause the tightening and twisting of pelvic muscles and ligaments, constraining the uterus. The goal of the adjustment is to reduce the effects of nerve interference and the associated dysfunction of the sacroiliac joint. The result? Neurobiomechanical function in the sacral/pelvic region is improved, benefiting pregnant mothers or others with sacral nerve interferences. The July/August 2002 issue of the Journal of Manipulative and Physiological Therapeutics reports that 82% of chiropractors using the Webster Technique reported success in reducing the sacral nerve interference. Sometimes when using the Webster Technique, the associated dysfunction of the sacroiliac joint can be reduced with just one adjustment. But usually it takes between three to 10 visits over a several week period. Because the Webster Technique relies on the inborn intelligence of the mother and baby, there is little risk. 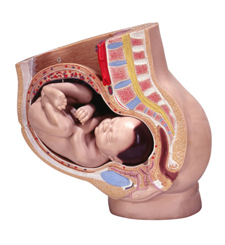 The Webster Technique is based on the positive experiences of pregnant patients, the clinical experience of its many practitioners, academic studies on the subject of sacral nerve interference and its consequences to proper pelvic function.